I am profoundly grateful to Mother M. Clare Millea, A.S.C.J. for making possible a pilgrimage to the Sanctuary of the Holy Face of Jesus at Manoppello in the Province of Pescaro, Abruzzo. Manoppello is the very place visited by Pope Benedict XVI last September 1, the same day on which I inaugurated this blog dedicated to the Vultus Christi, the Holy Face of Christ. Mother Clare and Sisters Barbara Matazzaro and Mary Grace Giaimo are all Connecticut natives. We left Rome early on the morning of Tuesday, 9 January with Sister Mary Grace at the wheel, praying the rosary (Mysteries of the Holy Face) as we rolled eastward towards the Adriatic The weather was clear and crisp. We had coffee when we arrived at Manoppello. I couldn't wait to enter the church to see the Holy Face. "Thy Face, O Lord, will I still seek; hide not Thy Face from me" (Ps 26:8-9). There was no one else in the church when we entered it. There, high above the altar, was the Holy Face of Manoppello. "Lift up, O Lord, the light of Thy Face upon us" (Ps 66:1). Approaching the Holy Face was an indescribable experience, one clearly willed and arranged by Divine Providence. We were greeted by Father Carmine Cucinelli, the Guardian of the Capuchin community at Manoppello, and by Sister Blandina Paschalis Schlömer, a German Trappistine nun and iconographer now living at Manoppello. Father Carmine arranged for us to have Holy Mass in the church: a Votive Mass of the Holy Face of Christ. What a joy for me to offer the Holy Sacrifice in this place that I have I wanted to visit for so long. I said with particular intensity the invocation that I pray silently every day when I elevate the Sacred Host: "Illumina, Domine, Vultum tuum super nos -- Lift up, O Lord, the light of Thy Face upon us." The proper texts of the Mass were exquisite. The Preface of the Mass praised God for giving us the image of the Face of His Son in this temple. I only regret that I did ask for a copy of the Collect and the Preface of the Mass. The Holy Face is a very finely woven veil stretched between two panes of glass. It appears to be made of an ancient sea-byssus fibre, a precious "marine silk" also found inside some sarcophagi of the Egyptian pyramids. This would be the "fine linen" mentioned forty-six times, neither more nor less, in Sacred Scripture. The cloth measures cm 17 x 24 (6,70 x 9,45 inches). The fabric is so thin that the image is visible before and behind and so transparent that a newspaper, put behind it, could be read even at a distance. It is the effigy of a long-haired man with a broken nose, a wispy beard and a short forelock on his bloodstained forehead (Mk 15:17; Mt 27:29); his half-open mouth seems to be about to utter something. In the dim light of a candle, the contrasting shades of brown seem to recede, allowing the darker bruises covering his the Face to become visible. His cheeks are dissimilar: one, rounder than the other, appears considerably swollen (Jn 18:22; 19:1-3). Dr. Donato Vittore and Dr. Giulio Fanti have, after examining the image under ultra-violet rays, confirmed that no paint is found on the veil. His eyes look upward, allowing the white of the eye under the iris to be seen. His gaze is one of wonder or amazement, but it is also benevolent and consoling. It expresses the love of Jesus for us even after His bitter Passion, reminding us that He said to the disciples, "Behold, I am with you always, even until the end of the age" (Mt 28:20). Sister Blandina Paschalis spent about two hours with us, explaining her original scientific research on the Holy Face. Sister Blandina is intensely devoted to the Face of Christ. When she kneels in prayer before the Holy Face of Manoppello, one senses the grace of contemplation given to those who seek and adore the Face of Christ. By placing exact photo slides of the Holy Shroud of Turin and the Holy Face of Manoppello one upon the other, Sister Blandina discovered that their transparent data-points fit together perfectly. The Face of Christ in death is given us on the Shroud of Turin, and the Face of the rising Christ -- Christ at the moment of His holy resurrection -- is given us on the Veil of Manoppello. Dr. Father Heinrich Pfeiffer, S.J., professor of iconography and history of Christian art at the Pontifical Gregorian University here in Rome, affirms that the Veil of Manoppello was, in times past, considered to be an image not made by human hands. 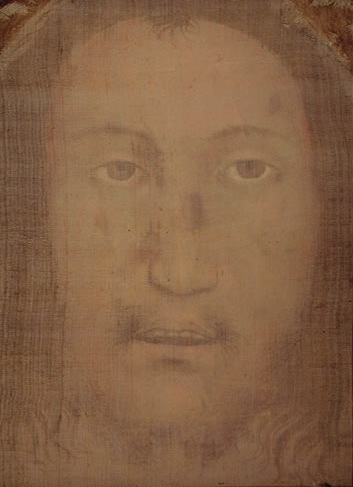 This sacred Image was the model for the later representations of the Holy Face. The Jesuit scholar also asserts that Our Lord gave us not only his Word by means of the Holy Scriptures, but also his Image formed in the tomb when a supernatural radiant energy illumined the "fine linen" soaked in aloe and myrrh, photosensitive "spices" (Jn 19:40), leaving divine evidence of the Passion, Resurrection and everlasting Glory of Our Lord Jesus Christ (Mt 28:7; Lk 24:51; Ac 1:9). On the door of the church: a sculpture commemorating the 500th anniversary of the arrival of the Veil of the Holy Face at Manoppello. The text is from Psalm 26: "It is Thy Face, O Lord, that I seek." This is the verse that souls devoted to the Holy Face find themselves praying ceaselessly by day and by night. "The Spirit himself asketh for us with unspeakable groanings. And he that searcheth the hearts knoweth what the Spirit desireth; because he asketh for the saints according to God" (Rom 8:26-27). The interior of the church and the high altar with the reliquary containing the Holy Face. 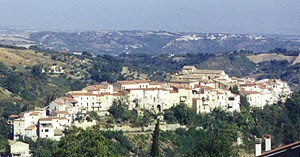 I am amazed that such a treasure is hidden away in a little mountain town of the Abruzzo, and so little known. How like Our Lord to choose a lowly and hidden place for the precious image of His Face! Apostles of the Sacred Heart of Jesus and lovers of His Holy Face: Sister Mary Grace Giaimo, Mother M. Clare Millea, and Sister Barbara Matazzaro. 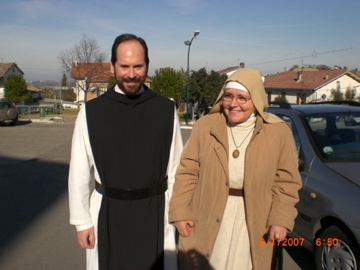 This pilgrimage to Manoppello was Mother Clare's initiative. One who contemplates the Face of Christ learns to read there the secrets of His Heart. Very inspiring, everything! Father, have you ever said Mass in Washington, DC at the Basilica Shrine of the Immaculate Conception? So glad you got to offer Mass there! Was there on the 21st of August, just a few days before your visit... Thank you for your photos - they are great. Did you notice the Stations of the Cross in the church? Very modernistic, yet nice. If I figure out how to upload it, I could add a picture of the 6th station. The Treasury upstairs had a lot of 'ex-voto' offerings, with crutches and other objects given in gratitude... I have no photos of that, but it was beautiful. This eastern coastal region of Italy is well worth the visit, with Lanciano and its Eucharistic Miracle just down the highway, and in the other direction, up to Loreto with the Holy House. Thank you, Father. I thought so. It is not clear to me whether the Holy Face is an imprint on the Veronica veil, which would be that of Christ on the way to Calvary, or that of a veil over his face as he lay interred, and that the image formed was at the moment of resurrection. The marks of suffering in a resurrection image, particularly the broken nose, would seem anomalous, and certainly do not tally with narratives of the post-resurrection appearances of Jesus in the gospels, where no bruising on the face is mentioned. I think this website is one of the most beautiful on all the web. That you so much Fr. Mark. What a grace that it was started on the day that our holy father Benedict XVI visited Manoppello and saw and prayed before the Holy Face of Jesus. I beg your indulgence to tell you that I recently visited the Shrine of the Holy Face in Manoppello and was able to pray before the image. It is truly a grace beyond all explanation to gaze upon the Holy Face, from less than a foot away, as in conversation with a friend who is also the great King. Great thanks are due to the citizens of Manoppello and to the Capuchin friars for their care for this incomparably holy image, and for welcoming all from far and near. While I was in Manoppello the rector of the shrine gave me a copy in English of the Votive Mass of the Holy Face, and also an english translation of the prayer to the Holy Face composed by Pope Benedict XVI on the first anniversary (Sept. 1, 2007) of his visit to the Shrine of the Holy Face on Sept. 1, 2006. If anyone would like a copy e-mail me at frost@usfca.edu and I will gladly send a copy. While searching for devotions to the Holy Face I came across your blog, what a treasure! Thank you for the prayer to the Holy Face found in the Chapter Room of the Cistercian monastery of Santa Susanna, it is exquisite (February 2007 post). So much richness and beauty in your writing and chosen images - I look forward to returning. Thanks for many delights. Thank you for your Holy Face web site. 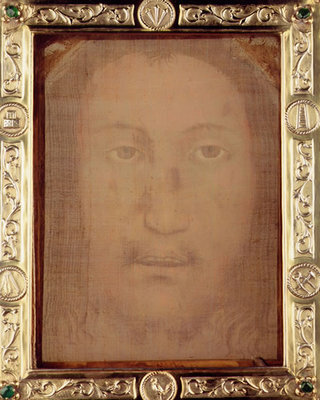 I am confused about the Holy Face of Jesus picture in Manopello, Italy. What about Veronica's Veil in St. Peter's. Rome? I have been to the shrine in Tours, France. I would like to go to Manopello in April next year to see the Veronica Veil and the Holy Shroud in Turin as well. Stay there for 1 or 2 days to contemplate and meditate. Anyone have interest, let's join together to visit.